The living room is the nucleus of every home, and it is one of the first spaces potential buyers notice when they enter the property. They say first impressions are the last impression, so if this space is outdated or in bad-shape then it’s definitely going to affect the value of the resale value of your house. Imagine looking through a run-down, shabby property with old-fashioned spaces and compare it to walking through a well-designed, comfortable and visually pleasant house – even you can imagine the difference, right? 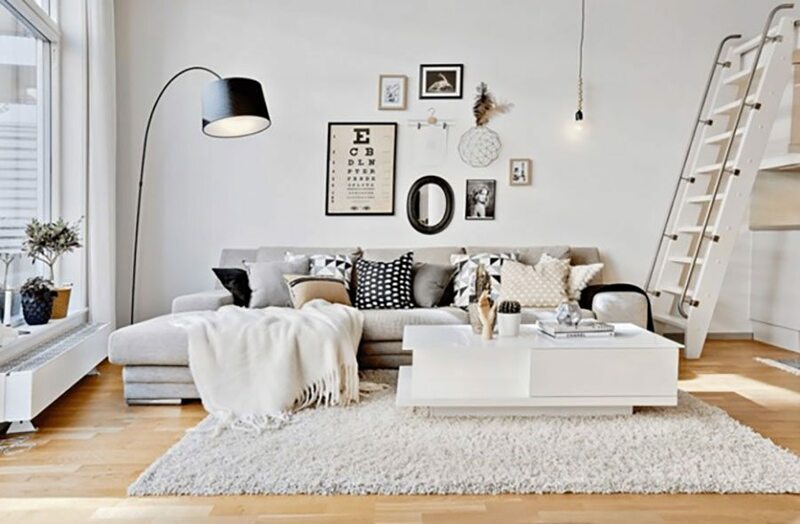 In order to leave the best first impressions on the potential buyers of your home, and to get the best value out of your property, here are 5 living room interior decoration ideas to welcome the spring buyers! Candle décor: You can use various kinds of candles as a decorative element. Instead of typical trinkets and bauble, place a cluster of candles on your coffee table or shelf to create a warm look within the space. Shag Rugs: Shag rugs are highly stylish and one of the trendiest ways to emulate cozy effect in your homes. You can use one as an area rug in your living room to invoke hygge within the space. Furry Throw Pillows: nothing says warm and cozy like a huge collection of mismatched throw-pillows on the couch. You can even use the furry ones to match the shag rug. Trendy Light Fixtures: Lighting is a critical design element for emulating hygge in your spaces. Aside from the war, the incandescent glow of the bulb itself, the style of the fixture is also pretty important. Try to go for shabby chic, rustic or industrial style fixtures with lots of personality to evoke an edgy look in your living room. A combination of all these ideas will surely turn your living room into a comfortable haven that’s sure to attract potential buyers. Asymmetry: An asymmetric furniture layout is an absolute essential while trying to evoke this concept. 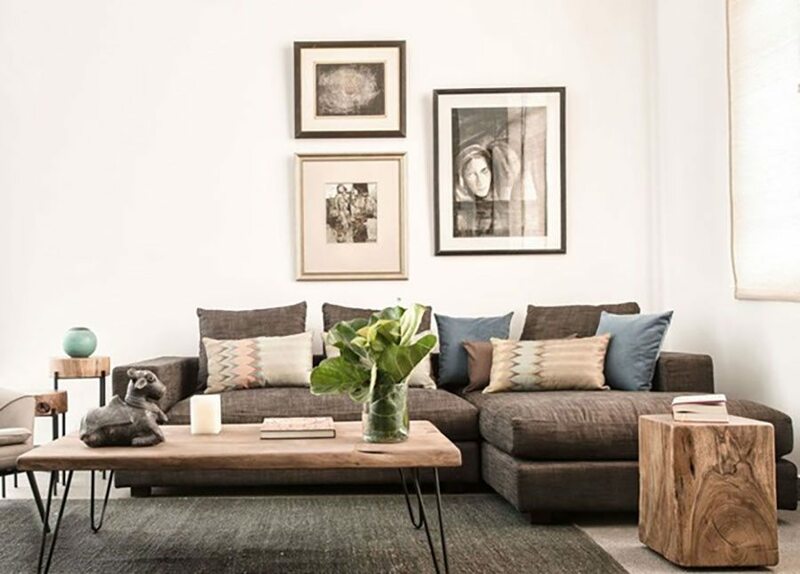 Artwork: Uneven gallery walls, tapestries and nature-inspired paintings are another great way to use Wabi Sabi. Accessorizing: Using accessories and decoration pieces to create a transient, imperfect decor formation on your feature shelf is a great way to emulate this concept. Distressed nature: You can use distressed materials like reclaimed wood and vintage frames to emulate an elegant shabby chic vibe in your Wabi Sabi inspired living room. The quirky, informal aesthetics of this style will be a sure hit with any potential buyers. 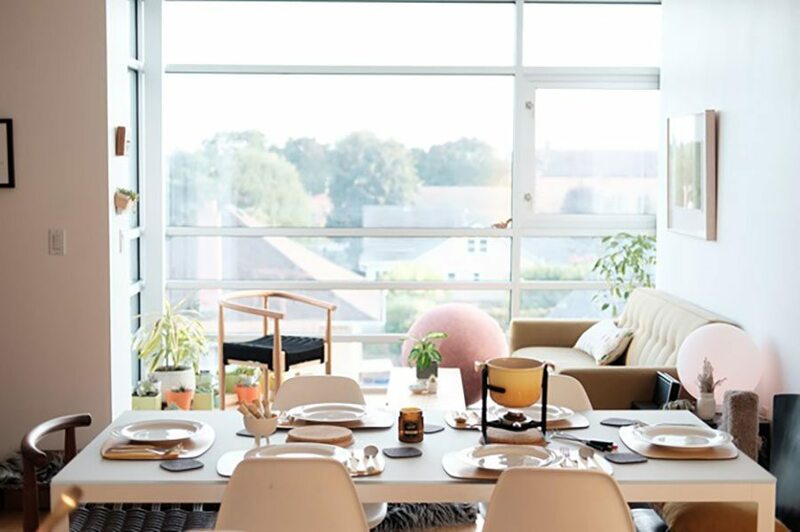 Natural Light: Natural light is a huge part of the Feng Shui concept, so make sure the windows are a prominent feature of your living room with classy window coverings like Venetian, roller or roman blinds. Indoor Plants: Indoor plants of any kind are said to help with the positive flow of energy within the space, so they’re an absolute must. Legged Furniture: Furniture – especially sofas, coffee tables and side tables – should have legs in order to promote the flow of positive energy. Symmetry: The layout of the living room must be symmetrical to have a holistic and uninterrupted flow of energy. No Clutter: Stowing away all the physical and visual clutter enhances opportunities and promotes the flow of positive energy. All these interventions help create a refreshing, clutter-free zone that will surely leave a great impression on potential buyers this spring. Neutral backdrop: You can paint your walls in a neutral color to create a peaceful backdrop. White, beige or a gentle brown hue will look great. Pastel Props: You can add small pops of color in this style by using pastel-hued You can go for colors such as tea pink, powder blue, yellow and pastel green. Indoor Plants: You can even use some indoor plants to emulate a natural look. The natural green will automatically add a refreshing vibe to your space. The natural comfort and trendy look of this décor style will definitely provide an amazing first impression to a buyer who walks in the house. Florals: The best way to emulate happiness in your spaces is by using florals. You don’t have to go overboard with stuff like Laura Ashley and retro chintz. A simple floor cushion, throw pillow or even a statement art piece with floral patterns will look great! Don’t know where to look – why not order them online and leverage discounts at Plusvouchercode.co.uk. Classy Materials: The concept of Lykke emulates a more extrovert approach by using classy materials like marble and laminates in its design. 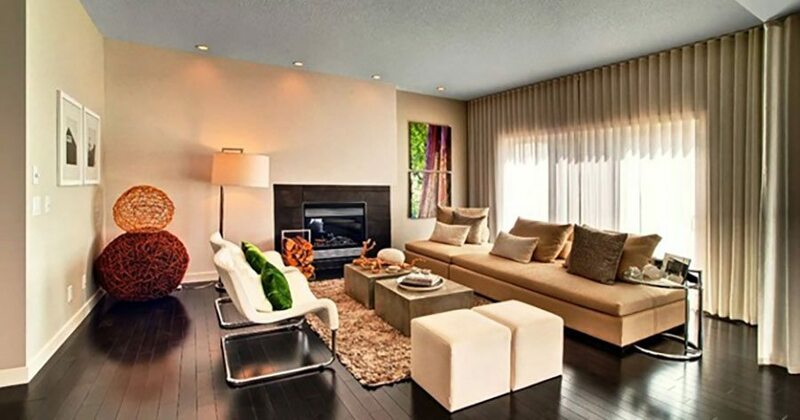 You can use table lamps and other decorative objects to use these accents in your living room. 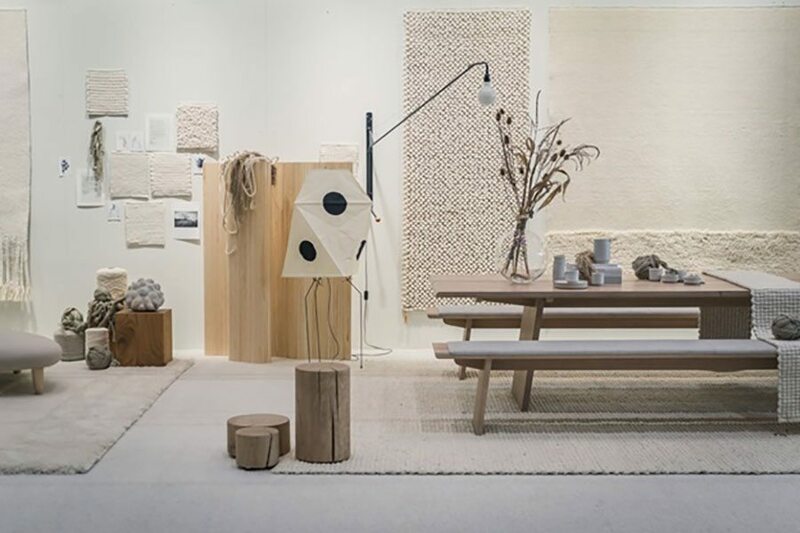 Neutral backdrop: All Danish concepts champion nature, so of course the Lykke also features natural accents like wood, stone and more. However, these material interpretations are generally lighter and more ‘neutral’ in tone. The happy energy of a Lykke style living room is sure to have an instantly positive effect on the buyers this spring. If you’re still unsure about improving the resale value of your property, then you can definitely find some great advice at Property Price Advice. They’ll be sure to give you some amazing suggestions to impress all those unimpressed buyers.